Brinner : What's in my closet and why isn't it working for me? What's in my closet and why isn't it working for me? In my need to reorganize and streamline my life, I know there's a huge challenge waiting for me. My wardrobe is not working for me as it is right now. I am working on getting rid of things that don't serve a purpose and I am dreading the project that is my closet! This is a photo of my closet taken just now as I was finishing this blog post. I read about an interesting clothes challenge. It's in Finnish, but that doesn't really matter. The gist of it is to challenge you to count all your clothes and share how many you have. There's no exclusions, you're supposed to count every item including underwear, socks, mittens and scarves. Now, I like numbers. Statistics and percentages. I like to keep track of things. So, clearly this sounds intriguing to me. It also goes nicely with my need to get rid of stuff. With somewhat limited free time, I'm not committing to doing this whole challenge, at least at one go. I will, however, go through parts of my wardrobe. If I get really into it, then maybe I'll keep on going... If nothing else, I'll get rid of some additional stuff. This is just a start in a larger quest to really figure out what my style is, how will it work for me and how to reduce the stress of getting dressed! 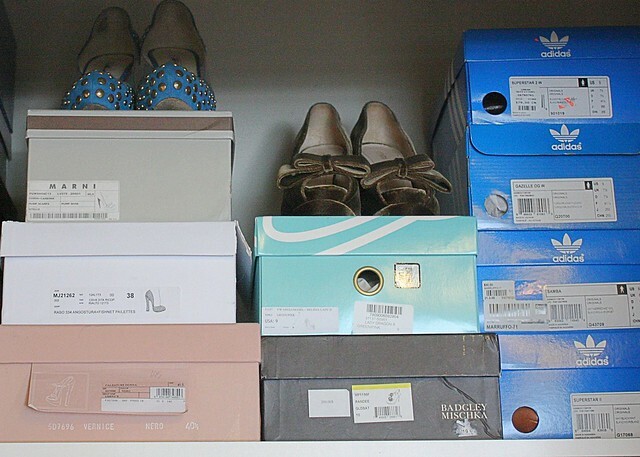 Some of my shoes... You can see exactly the two types of shoes I love, crazy heels and (Adidas) sneakers! I've gotten rid of a whole lot of clothing since the move to Toronto just over a year ago. It has been an ongoing project since moving and every time around I get rid of a few more things. What I do with all of the clothes is another topic that I'd love to get into another time, but for now it'll suffice to say they will no longer crowd my limited storage space. Like I said before, I dream of a closet where everything fits and has a purpose. I'm OK with storing out of season clothes in the basement, but those will have to be in good working order and functional without any crazy prep-work. I also mentioned that since I absolutely hate clothes shopping, I have a lot of things that are almost what I need. Fact is though, that 'almost' means that it'll either stay in the closet or I don't feel fully comfortable in it when wearing that piece of clothing! And neither those sound like a really good outcome to me! I love fashion, but trying things on can be such a drag. I have admittedly on more than one occasion bought things that are "close enough" instead of waiting for the right one. I am working on my bad shopping habits, but that's what I have to work with right now. I promise to share at least some of my clothes counting and wardrobe overhaul results with you! 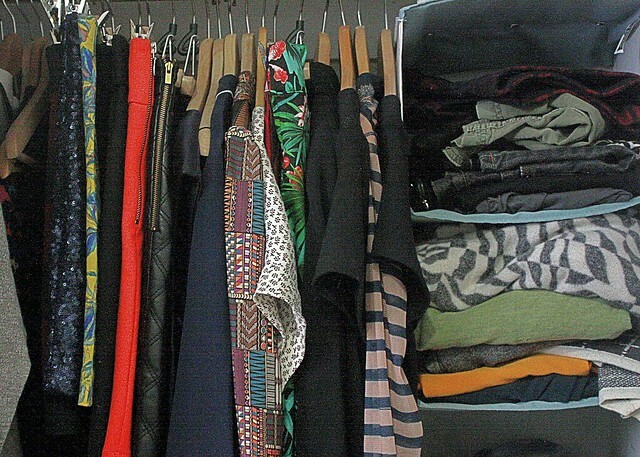 Do you know exactly what's in your closet? Does everything have a purpose? My closet looks like a tornado came through. I have things all over the floor and it needs to be downsized real bad. I have so much stuff to get rid of. Sounds very familiar! Currently mine isn't too bad, but that's only because I only use a small part of the clothes in my closet. Once I start taking more of things into use, the worse it'll get. I'm exactly in the same situation, which is why I'm trying to get rid of a lot of things! Mä en todellakaan tiedä mitä kaikkea mun vaatekomerossa on. Vaikka "siivosin" sen tyyliin joulun aikoihin tai vähän ennen, vai oliko se jälkeen? Äh samapa se.. Enkä todellakaan tiedä, mitä mun lipastossa on ja sen joudun sentääs järjestelee aika usein - koska niin täynnä kamaa. PLUS mulla on hirrvee kasa vaatteita kellarissakin. Ei mitään tietoa mitä siellä on. Mutta nyt! Kirppari pitäisi varata viikon päästä, eiköhän multa sitten onnistu. Tajusinpa nyt tuonkin, etten mäkään oikein tykkää shoppailusta. Tai riippuu todella paljon kenen kanssa menee ostoksille. Se on muuten välillä niii-iiiiin tylsää. Varsinkin jos suunnittelee jonkun kanssa, että hei nyt viiden viikon päästä mennään shoppailemaan. Mmitä jos kaupoissa ei silloin oo yhtään mitään kivaa ollenkaan? Hmm. Itseasiassa aika tarkalleen sama tilanne... Ma oon siis 'siivonnut' mun kaapit jo kertaalleen tassa vahan aikaa sitten. Se oli tosi hyva, mutta ma jatin paljon niita melkein releita. Sen takia ma just yritan tata laskemishommaa ainakin osan kohdalla. Tiedanpahan ainakin mita siella on! Kirppris olis tosi tarpeen mullekin! Taalla ei vaan harrasteta sellasta pahemmin. Yard saleja kylla, mut vasta kesalla. Voi olla etta testaan sellasen jarkkaamista kesalla, mut se ei tahan hataan oikein jeesaa. Musta tuntuu etta tohon shoppaamiseen pitaa ainakin mun keksia joku systeemi. Tosiaan jos menee kerralla kunnolla, niin mita jos mitaan ei loydy? Ehka silleen tasasesti pitais kayda, muttei liian usein... En tiia. Kaupoilla haahuilu on ihan jees (seurasta riippuen tietty), mutta ei sillon kun pitaa oikeesti loytaa jotain.